Want an inside look at how my brain works? Well... Last week on Facebook I asked my fans for summer kid snack ideas, which inspired me to create my Kid-Friendly Trail Mix. It also gave me the idea of freezing yogurt. One fan commented that they put yogurt in a piping bag and pipe out dots on wax paper and freeze, creating Fro-Yo Bites. 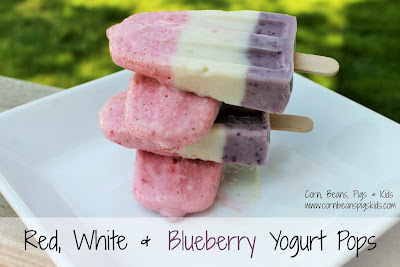 I decided to combine that idea, with my kids love for making homemade popsicles, along with this weekend's Independence Day holiday, and created Red, White & Blueberry Yogurt Pops! In a blender, mix one container of yogurt with a 1/2 cup of milk. Blend in strawberries til smooth. Pour mixture to the 1/3 line of each mold. Next, blend another container of yogurt with another 1/2 cup of milk. Blend in the banana til smooth and fill molds with the mixture up to the 2/3 line. Lastly, blend the final container of yogurt with the last 1/2 cup of milk. Blend in blueberries til smooth. Fill each mold full. Set popsicle sticks (that have been soaked in warm water for 30 minutes to keep them from floating up in the molds) in each mold. Freeze for at least four hours. Yields 12 popsicles (plus a little extra for immediate sampling). What would you caption this photo??? Don't have a popsicle mold? Put the yogurt layers in tall glasses creating a fun and colorful smoothie! No matter how you enjoy this festive treat, you'll love the tangy, yet sweet flavors. Each layer has its own spotlight as you make it through the popsicle. I asked our son LP what his favorite flavor was and his exact words were, "The strawberry, and the banana, and the blueberry." So there you go - it is all good! Do you have any Red, White & Blue recipes you're going to make this weekend to help celebrate Independence Day? If so, I'd love to hear about them! Be sure to share below and remember to Comment for a Cause! Those look amazing as do all the creations you com up with for your kids. Yum. It is that time of year when popsicles are a hit for sure! Thanks Beth Ann! When I toured AE Dairy this winter I was surprised that I liked Greek Yogurt, so I thought it'd be fun to work with in a popsicle. Yes - both delicious and healthy. They're just yogurt, milk and fruit. No added sweeteners. Clicked on you twice from July Country Fair Blog Party! These look delicious... I really need to get some popsicle molds! Yay! We got popsicle molds this year and have really enjoyed coming up with different recipes. I'm actually thinking about getting some silicone ones and try them out: http://amzn.to/1HBOT6Y. Stopping by from the Country Fair Blog Party to say hi - and to tell you these pops look so yummy. Definitely need to be making these soon! Thanks for stopping by! Hope you enjoy them! My grand daughter would love these! I wish she lived closer! I may have to make them for myself! They're fun, festive and delicious! My grandkids are coming out now! So I will be trying to make them! So glad you reminded me by sharing this at Celebrate365 blog party! These are so festive! Little Dude loves making popsicles, but I'm not very creative. I need to make some of these!